Since their first gig together in March 2018, Uk Folk/Americana duo Roswell have gone on to win the Purbeck Rising 2018 competition, have their debut single 'Heaven Knows' selected for FATEA’s Winter Showcase and record their debut EP at the Roundhouse. 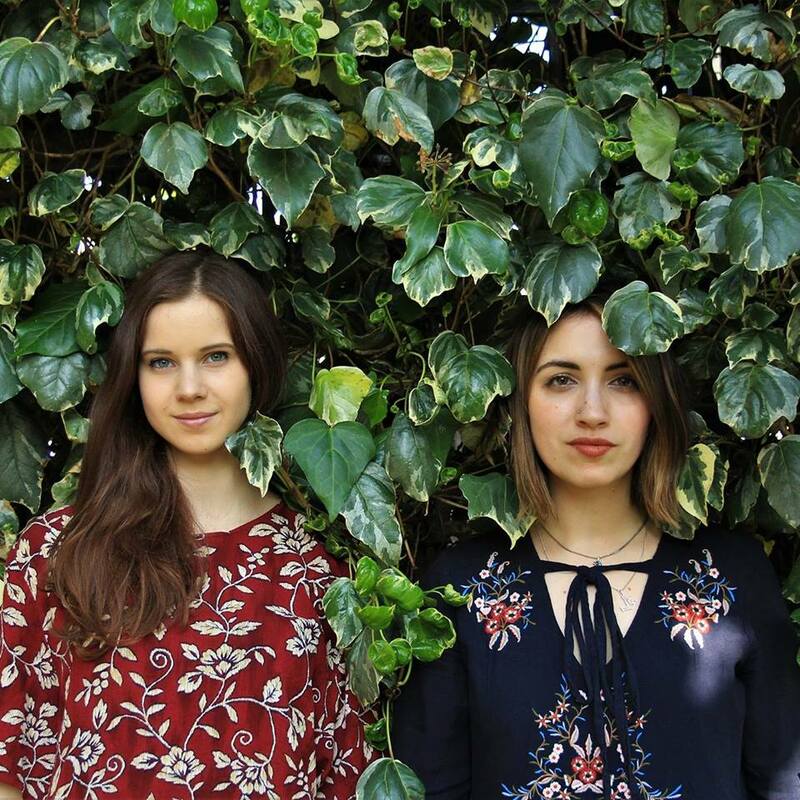 Jasmine and Zoë have been combining their love of intricate vocal harmonies and folk music since they met at an open mic in Ely and are planning a very exciting 2019, including working on their next release and appearing at festivals from Swanage to Switzerland. One of our favourite Scottish singer-songwriters is the very excellent Edinburgh born Ross Wilson aka Blue Rose Code. A wonderful writer of Caledonian Soul whose live performances are not to be missed. At the edge of contemporary alt-folk, Ross' music evokes a meeting of Van Morrison and a young John Martyn, both shipwrecked with a bunch of Motown records. His last album has just been released on vinyl (14th October), preceded by a double A-side single to promote the release, 'Chasing Sunlight/Rebecca'. '...AND LO! THE BIRD IS ON THE WING' is the new album from Blue Rose Code. Previewed to a sold out theatre at 2016’s Celtic Connections, released on 4th March and supported by a UK and European tour. Recorded at Gran's House Studio in the Scottish Borders and written between the Shetland Isles and rural Dorset, '...AND LO! THE BIRD IS ON THE WING' features the finest Scottish Jazz and Folk musicians, Nashville Gospel singers, The McCrary Sisters, British music legend Danny Thompson and Hollywood A-lister, none other than Ewan McGregor. Of the new record, Ross says, "It's an album for music fans and musicians, a challenging record. I'm passionate about that fusion of folk and jazz and where it intersects with songwriting. Working with these musicians has been a game-changer. I may have cut my throat because there's not really a single on here but, this is the album that I've written and it's just as I wished it to be." In the space of only a short few years and two stellar albums Ross has gone from song-writing in the obscurity of an East London flat to being celebrated by the industry and fans alike as a legacy artist whose work stands alone. As BBC Radio 3 broadcaster Mary-Anne Kennedy said recently, “Blue Rose Code is one of those rare artists whose work makes you sit up and listen”. 'GRATEFUL', the first single from the new album was released at the end of 2015 and was playlisted on BBC Radio Scotland for a full five weeks. Truly remarkable for an act without the backing of a label or a heavy management deal. Essex based James Smith is a very talented and fast rising young singer-songwriter. With over 2M views on YouTube and over 20M streams on Spotify James is quickly establishing a loyal fan base. He also recently signed to Virgin EMI Records. The 19-year-old James is definitely one to watch for the future. With a fantastic debut album 'Soaked To the Bone' released in 2015 and multiple tours of the USA, the future is looking very bright for Ray and Sian. Watch out for new music coming this year. Bands and collaborations: Applewood Road, Vena Portae, Emily Barker & The Red Clay Halo, Marry Waterson + Emily Barker. Our next LCM featured multi-award winning singer-songwriter is often described as one of Australia's finest exports. She is also one of our favourites. This Western Australian native from Bridgetown, has now made her home in the UK. Emily travelled to the UK in 2002 and was first based in Cambridge where she collaborated with guitarist Rob Jackson. They formed a band called 'the-low-country' which released two albums, Welcome to the-low-country (2003) and The Dark Road (2004), tracks from which enjoyed plays on John Peel's BBC radio show.. In October 2005 Emily won Country Song of the Year and Regional Song of the Year awards at the annual West Australian Music Songwriting Awards. Also in 2005, Emily started work on her debut solo album, 'Photos.Fires.Fables'., released on Emily's own label Everyone Sang. The release of this album saw the birth of The Red Clay Halo, an all-female trio of Anna Jenkins (violin, viola), Jo Silverston (cello, bass, banjo, saw) and Gill Sandell (accordion, piano, flute, guitar).Emily released three full albums with The Red Clay Halo: 'Despite the Snow' (2008), 'Almanac' (2011) and 'Dear River' (2013). Emily is also the songwriter and performer of the theme to BBC TV’s 'Wallander' starring Kenneth Branagh. Her music is a blend of roots influences from country to English folk via 60s pop. Alongside the Wallander theme, Emily has also provided the theme music to BBC TV drama 'The Shadow Line' (which won an Ivor Novello for best TV soundtrack for series composer Martin Phipps) and has recently (in collaboration again with Martin Phipps) composed music for Daniel Barber’s The Keeping Room (Sam Worthington, Brit Marling, Hailee Steinfeld) as well as her first feature length soundtrack, for Jake Gavin’s UK road movie Hector starring Peter Mullan. Emma Ballantine released her excellent EP called 'Somebody's Story' in April 2017, based on stories sent to Emma by other people. Featured by Q Magazine and tipped by Glamour as 'One to Watch in 2016’, Emma Ballantine is rapidly gaining recognition for powerful songwriting and a ‘shapeshifting vocal gift’ (Gigslutz). A finalist in the UK Unsigned Songwriter of the Year competition, Emma’s music has been played by BBC Radio 2, BBC 6Music and BBC Introducing and she has been described by Resonance FM as ‘a unique voice among modern songwriters’. Fiona Bevan’s bewitching music has roots that run deep. They stretch as far back as the Suffolk-born singer’s childhood home, in which her family sang songs from black and white films and old musicals around a piano and her parents played her Cole Porter and Doris Day. They snake through her spell as an English literature student, several years spent perfecting her craft on the London club circuit and an extraordinary career as a writer that ranges from commissions for film, classical compositions and a Tate exhibition to co-penning a multi-platinum chart-topping hit, ‘Little Things’, with Ed Sheeran, for boy band behemoth One Direction. That Fiona describes her debut album as ‘pop in disguise’ makes perfect sense. The dozen, dynamic songs on 'Talk To Strangers' have hooks, harmonies and melodies that linger from first listen, but they are defiantly timeless as opposed to time-bound, as rooted in the past as they are in the present and purposely hard to pin down. Among the guitars, drums and piano, you’ll hear violin, double bass, accordion and harp, all played by Bevan, a hapi drum played by producer Shawn Lee and birdsong, some of it real, some of it whistled by Bevan-as-bird. “I love clever, interesting pop and I adore storytelling,” says Fiona. “It’s important to me that no words are wasted. I write about real things that have happened to me or my friends. I try to find the focus of a story and work from there. “My writing process is really an attempt to understand who I am and how not to be walked over in the world – as a woman, as a shy person, as someone doing something different. I’d say it’s about finding myself, if that didn’t sound so terribly cheesy.” Talk To Strangers’ first single, The Machine, is about… well, everything. “Before I play it at gigs I say it’s a song about everything,” laughs Fiona. “It sounds really big, but in fact it’s about the small parts of a machine – the pistons, the cogs, the fuses. It comes from being angry and frustrated about the state of the world and from my feelings of powerlessness to do anything about it. Within the song, there’s a shift – that’s about breaking out and finding how you can have power in your own life, in everything you do. The industrial theme is mirrored in The Machine’s hypnotic rhythm and clanging percussion, which are in vivid contrast to the spritely vocal and the frisky, looped acoustic guitar. The almost conversational, Sondheim-esque shift sees Fiona urging herself – and her listeners – to take control. Talk To Strangers is littered with references to film and literature. The jazz-tinged Rebel Without A Cause was written after the London riots – James Dean being a metaphor for listless youth – but it’s also a love song that offers a fleeting glimpse of a relationship at a specific point in time. Or as Fiona puts it, ‘It’s a let’s go somewhere else sort of love song’. The album’s gorgeous closing track, the lush The Last Days Of Decadence, was inspired by both the financial crash and a flyer bearing the same name that Fiona was handed in the street. Among a handful of heartbreak songs on Talk To Strangers is the stunning Us And The Darkness, which first appeared as the title track of an EP Fiona self-released in 2011, but has since been rerecorded. The beautiful melody, beguiling vocal and twinkly sounds belie the circumstances in which it was written. The song she wrote with a pre-fame Sheeran (the pair used to play the same club nights) spent years lost thanks to a misplaced mobile phone before Fiona came across the lyrics on a piece of paper. She sent them to Sheeran, who remembered and recorded the music. One Direction overheard Little Things, insisted they have it and took it to the top of the charts in late 2012. Last year, Fiona wrote, recorded and toured with jazz vocalist Gwyneth Herbert. Reviewing the show in London, The Guardian gushed that “Fiona took us on startling odysseys that suggested Erykah Badu, Joanna Newsom and Kate Bush spine-tinglingly joined”. More recently, she has been in L.A. co-writing with Grammy Award-winning producer John Shanks. Talk To Strangers was entirely composed by Fiona over the past four years and recently mastered in San Francisco by the legendary George Horn, who has been cutting vinyl since the ‘60s for musicians including Paul Simon, Sly & The Family Stone, Bob Dylan and John Coltrane. If the album feels like a long time coming for an artist already established live, it’s been well worth the wait. Those deep roots have spawned something truly special. Their critically acclaimed second album 'Night Hours' was released in December 2016 on Fellside Recordings. Described as 'exhilaratingly diverse and full of impeccably crafted songs', it has cemented the duo’s reputation as two of the most exciting musicians and social commentators on the scene. Jimmy Aldridge and Sid Goldsmith have recorded their third album in the spring and will be performing at festivals throughout the summer (including Warwick, Ely, Fire in the Mountain, Bude and Chester). The new album is due to be launched at Kings Place, in London on September 6th.